Can the SAM Labs Science Museum Inventor Kit help your child to become more creative? Creativity scores among K-12 students have been declining significantly since the 1990s, according to educational psychologist Kyung Hee Kim. This drop in creativity scores coincides with children having less and less time for free play. Studies show that children now have 25 percent less creative playtime since 1981. Many believe that toys like the SAM Labs Science Museum Inventor Kit can help your child to develop their creativity. It can also offer them more opportunities for free play. Can this kit also help them learn the concepts of science, technology, engineering or mathematics? Most importantly, is it fun? SAM Labs Science Museum Inventor Kit: Should You Buy It for Your Kids? The SAM Labs Science Museum Inventor Kit allows your kids to come up with an electronics project without needing to solder anything. They don't even have to deal with wires. This means that they can explore independently and safely. What else can you expect from this inventor kit? Image: Video screen capture, SAM Labs kit, via YouTube, caption and filter added. An electronics kit without wires? How does that work? And yet it does. So, what's in the box? Image: Video screen capture, SAM Labs kit and connectors, via YouTube, caption and filter added. The SAM Labs Science Museum Inventor Kit comes with four wireless blocks, including a light sensor, a tilt sensor, a buzzer, and a DC motor. Each block is inside a thick plastic enclosure, which protects it from damage. However, you can also take off the covering to let your kids see how each component works. The tilt sensor and the light sensor are both input devices, while the motor and the buzzer are output devices. The kit also has everything you need to power and create your projects. There is the micro USB charging cable that will charge the batteries in each module. There is also a Bluetooth 4.0 dongle that can wirelessly pair the blocks to your computer, tablet or smartphone. The kit also provides a motor attachment. The SAM Space app is the brains of the kit. You will need to download the software suite to your computer for the toy to work. When you turn each of the wireless blocks on, it will show up on the SAM app's workspace. You can draw a connection between two modules, then specify an action. For instance, you can draw a line to connect the light sensor to the buzzer, then have it sound when the lights go out. The SAM app also contains five starter projects with easy instructions. It also comes with several services, which allows you to make the SAM modules work with other things. You can also use the SAM app to send tweets, take a picture, or update your Facebook status automatically, with the sensors acting as the trigger. What's more, you can also use the output devices to interact with these services. For instance, you can have the buzzer sound when you get a tweet. You can download the SAM Space app from the Microsoft Store. It is also available for iOS and Android devices. The SAM app has five starter projects that will teach you about what each wireless module does. You can learn Morse code, or create electronic music. You can also build an alarm system or a mini drum machine. Lastly, you can make your drawings on paper come alive with sound. IFTTT is short for If This Then That. With IFTTT, you specify conditions that can trigger specific actions in other devices or services. For example, there is an IFTTT recipe that will allow Gmail to automatically send you an e-mail if a security camera detects movements outside of your home. The SAM Labs Science Museum Inventor Kit works with IFTTT recipes that allow it to interact with connected devices such as the Philips Hue lights, TVs, dishwashers and every smart appliance in your home that is compatible with the service. It can also work with blogging platforms, bookmarking sites, business services, calendars, clocks, cloud storage, communication tools, social networking, and a variety of other services. Amazon customers give the SAM Labs Science Museum Inventor Kit a rating of 4.3 stars out of 5. Reviewers find this inventor kit amazing, with fun and carefully thought-out activities. They also like how this fun kit can help kids learn how to code. Customers also praise how well this inventor kit works with IFTTT recipes, which makes it a whole lot more useful. The IFTTT compatibility allows users to use the module with their connected devices and other services. Some negative reviews, however, talk about how expensive the kit is. Meanwhile, others hope that there were more modules included, especially at its price. The SAM Labs Science Museum Inventor Kit costs anywhere from $130 to $185, depending on your retailer. You can buy this from online retailers such as NewEgg.com, Sammat Education, or the Science Museum Shop. To write this review, we looked at the product's page on several online retailers, as well as the reviews and write-ups from credible tech and education sites such as PCWorld and UKEdChat.com. We followed a similar process for each of the featured competitors. Fortunately, we now have several educational toys that familiarize children with Science, Technology, Engineering, or Mathematics (STEM) concepts and coding, while also encouraging kids to be more creative. How does the SAM Labs Science Museum Inventor Kit compare with similar inventor kits such as the Engino Inventor, the littleBits Avengers Hero Inventor Kit, and the Makey Makey An Invention Kit for Everyone? The Engino Inventor gives you enough pieces to build 50 different motorized models. Some of the models you can make include a windmill, a chopper, a forklift, and a dog. The kit has all the pieces you need, plus a motor and an instruction manual. If you lose the manual, you can download 3D-rendered instructions. Like the SAM Labs Inventor Kit, the Engino Inventor allows you to create your own models, as well. You can create anything from simple machines to more complicated stuff. What's more, you do not need a computer to build the projects. The Engino Inventor gets a rating of 4.4 stars out of 5 on Amazon. 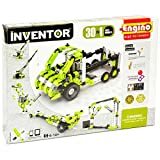 Reviewers love how the Engino Inventor delivers on its promises as it allows your kids to have fun building while also learning design and engineering. Others praise the step-by-step instructions that are easy to follow. However, some reviewers complain that it was difficult to pull the pieces apart, which may mean that parents might probably need to supervise younger kids and offer a hand when they cannot pry one block from another. Prices for the Engino Inventor range from $50 to $75. Code your gauntlet to unleash 10 authentic Avengers sound effects or record your own hero battlecry. The littleBits Avengers Hero Inventor Kit allows your little ones to build their superhero gear and customize it however they like. They can come up with their own designs and have props like the ones they see being used by Black Panther, Iron Man or Ant-Man. They can also accomplish at least 18 activities that they can find on the app. With the littleBits Avengers Hero Inventor Kit, your kids will also learn block coding, as it is one of the activities included. There is also a LED matrix that your children can play with, allowing them to customize light designs. This kit has nine littleBits, seven hero gear components, and two sticker sheets. It also has wearable tech sensors and authentic Marvel Avengers sound effects. You will need to download the littleBits Avengers Hero Inventor app to unlock the kit's features. The littleBits Avengers Hero Inventor Kit has a rating of 4.8 stars out of 5 on Amazon. Reviewers like this kit for being straightforward. If your kids love LEGO, then this kit will be a good alternative. It may be geared towards younger kids, who will have lots of fun with this kit. Other reviews like the magnets that keep the littleBits together, as well as the Iron Man hand that doubles as a stand. Everybody agrees that this is a cool toy, but some reviews talk about its expensive price tag, which they think should be a bit lower. Pricing for the littleBits Avengers Hero Inventor Kit ranges from $145 to $155. You can buy this from the littleBits store or online retailer sites such as Amazon. The Makey Makey Classic can make learning STEM concepts a whole lot easier and fun. Unlike other kits, however, this kit will appeal to your and your kid's inner MacGyver. The Makey Makey kit requires your kids to use everyday objects as part of your inventions. For example, the little ones can use the Makey Makey Classic to create a piano using bananas. Or they can make a video game controller using a notepad and some clay. They can even turn your entire family into a human synthesizer. This kit has the Makey Makey Board, seven alligator clips, six connector wires, a USB cable, color stickers, and instructions. The documentation is also available online. The Makey Makey Classic has a rating of 4.4 stars out of 5 on Amazon. Verified buyers of this kit love how it helps kids have a very creative mind. It can work with everyday objects, and that makes it more fun for kids. However, some reviewers complain that the kit they received did not work. Others also note that their children quickly got bored with it. Nevertheless, the Makey Makey Classic is an exciting kit that allows your kids to create as much as they want with anything they like to use. It helps that it is moderately priced at around $40 to $55. Also out of the three competitors featured here, this is the only one that trumps the SAM Labs kit when it comes to interactivity. The SAM Labs inventor Kit might work with IFTTT-compatible smart devices, but the Makey Makey Classic can work with just about anything. One of the best things about the SAM Labs Science Museum Inventor Kit is that the motor and the buzzer are not simple on-and-off machines. For instance, the motor can change speeds depending on the input. The buzzer also has different notes. The five starter projects are an excellent way to introduce a beginner to the SAM Labs Science Museum Inventor Kit. However, the whole point of the kit is to let you and your kids create your own inventions using the wireless modules and the associated services in the SAM app. You will love the countless hours that you will spend thinking up of great projects that can range from whimsical to useful. A rechargeable battery powers each of the four blocks. You can connect the internal battery to the micro USB cable and charge it when the power runs low. Lastly, you will also love the compatibility with IFTTT recipes because this allows the SAM Labs Science Museum Inventor Kit to interact with your appliance and services, thereby extending its usefulness and making more connections possible. The SAM Labs Science Museum Inventor Kit is a product that gives you no excuse to hate it. However, the pricing has turned some people off. For a kit with only four working modules, paying more than $130 might seem a bit too much for some. Dabbling with electronics used to mean getting burns from soldering, or having to deal will all those wires. With the SAM Labs Science Museum Inventor Kit, you don't have to worry about your kids handling a soldering iron. This kit gives your kids an easy way to create working circuits without wires. That's not the biggest reason why you should buy this kit, though. The SAM Labs Science Museum Inventor Kit is very easy to use, you can draw the connections. However, behind its simplicity, your kids get a lesson in creativity and STEM all in one go. Do you have a favorite kids STEM kit? Tell us about it in the comments! SAM Labs Science Museum Inventor Kit is one of the most popular educational toys in the market today. Although it can be a bit pricey, the features it offers are very beneficial to kids. Previous articleAsus ZenPad S 8.0: Should You Buy It for Your Kids?